Boo hoo! So much for a day trade! Despite an upbeat RBA statement and upgraded Australian growth forecasts, AUD/USD gave in to risk aversion yesterday and gave my account a huge dent. As it turns out, weaker than expected Chinese data was enough for traders to let go of the higher-yielding Aussie! Because of that, AUD/USD was unable to break above the 1.0600 handle after a couple of attempts. 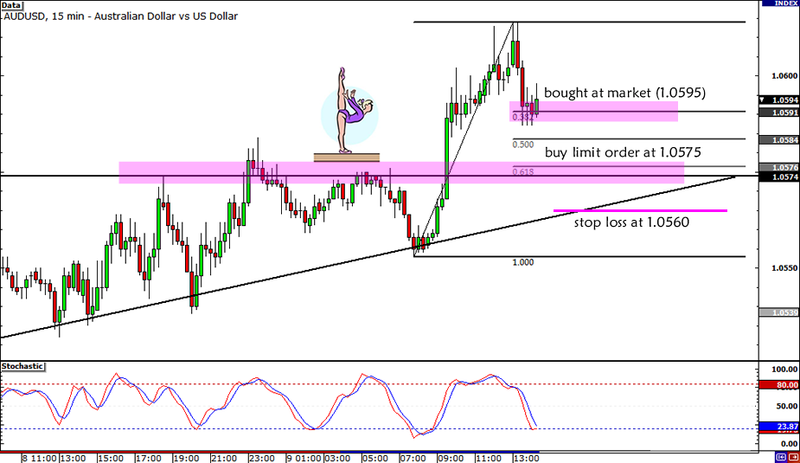 Later on, the pair slid back down to trigger my second long entry and eventually stop me out on my trade. I know most of y’all have been warning me against this particular trade since AUD/USD was giving several bearish technical signals on the longer-term time frames and I should’ve taken your advice. I’ve been seeing conflicting signals when it comes to fundamentals and technicals lately, but it’s nice to know that you guys got my back! Maybe I need to take a bit of a break to clear my head and hopefully get a better feel of the markets next week. See you on the other side of the weekend, folks! Guess who’s jumping in on AUD/USD’s rally? I am! Over the past couple of days my Twitter friends and I have been waiting for an opportunity to short the comdolls. 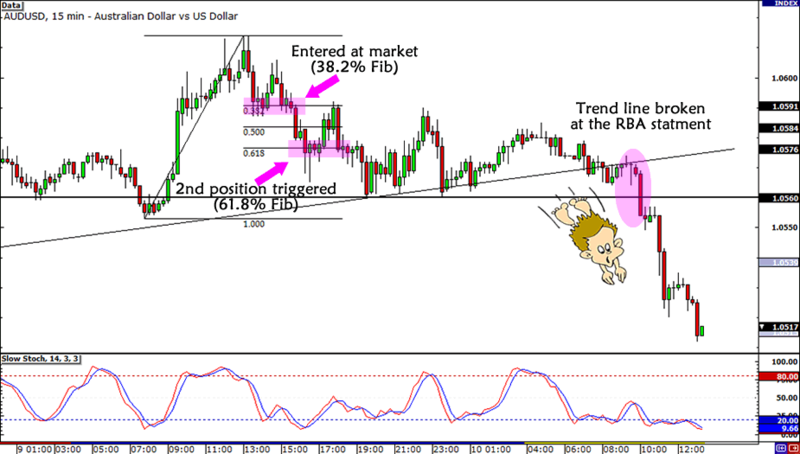 Heck, I even pointed out the divergences on this week’s Comdoll Trading Kit! Unfortunately, we didn’t have fundamental basis for shorting the comdolls. Gold and oil prices are on a roll this week, and Australia in particular had just shown us its surprisingly stronger-than-expected employment numbers for July. Even China is contributing to the rally when its inflation report lessened PBoC rate cut speculations. And then there’s AUD/USD’s irresistible chart setup. The pair broke above the 1.0600 early this week, and it doesn’t look like the Aussie bulls aren’t resting anytime soon. After hours of waiting, I finally found a possible retracement level where I can enter my day trade. I just entered 0.50% of my account at market (1.0595) since it’s right near the 38.2% Fib on the 15-minute chart. I placed another order worth 0.50% at the 61.8% Fib, which is near a former support and today’s open price. I placed my stop loss at 1.0560 since it’s just below the rising trend line and the week open price that we had marked on this week’s Comdoll Trading Kit. I’m planning to take profit around the 1.0650 area, but I’ll probably move my stop to break even as soon as the pair makes a new high today. Bought at market (1.0595), placed another buy order at 1.0575, initial stop loss at 1.0560, initial profit target around the 1.0650 area. Make sure you read the risk disclosure if you’re planning to take this trade with me! What do you think of this day trade? Is this something you could take? Your two cents are most welcome! Have fun and good luck trading this week, friends!